A Superb Chocolate and Mint Tea That Really Does Taste Like Candy! Summary : This tea probably comes as close to a chocolate-mint piece of candy that you are likely to find. This tea, in short, is ideal for people who have a big chocolate and/or mint sweet tooth but want to avoid the heavy calories of candy. Review : Chocolate + Mint = Heaven. At least in my book, although it has been said that I have a very "short book." Translated, that means I have no life, so I find solace through chocolate and mint. Sadly, chocolate and calories go hand in hand. Same thing for mint. And of course, let's not forget the tooth-decaying properties of chocolate and mint too. Happily, Culinary Teas has come along to rescue people like myself who have an absolute need for chocolate and mint in their lives but who wish to steer clear of both calories and tooth decay. Culinary Teas achieved this neat feat through their absolutely superb Chocolate Mint Rooibos tea. And no, the name of this tea does not lie! 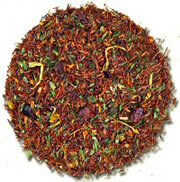 Here is how this tea is described on Culinary Teas website : "Rooibos with bits of chocolate and peppermint leaves. This mint herbal tea is better than any candy." Now, I've been a sucker for false advertising before. However, my skepticism disappeared the moment I ripped open the vacumn sealed bag that this tea comes packaged in. Talk about fragrance. Chocolate. Mint. The aroma of both of these come charging out of the bag like a wild horse, and soon invaded my entire kitchen. And who in their right mind can complain about a kitchen that smells of both chocolate and mint? I suppose it is probably redundant to say what this tea tasted like, but in the effort of being complete I will....it tasted like chocolate and mint, what else? There, now you have it...a roobios tea that really does taste significantly like both chocolate and mint. How Culinary Teas accomplished this neat little trick I don't know. I don't really care, either. All I know is that they did, much to the delight of my body and my teeth. The after-taste of this tea is also superb. The taste lingers on and on, providing a nice, somewhat gentle taste of both chocolate and mint. The after-taste isn't as powerful as their Peppermint Tea is, but it is a heck of a lot stronger than any supermarket bagged tea you'll find. Recommendation : Yes! If you like chocolate or you like mint, or preferably both, you'll most definitely like this tea. While maybe not quite the "perfect" substitute for a chocolate mint piece of candy, this tea comes awfully close! Brewing Instructions : Use 1 teaspoon of leaves. Pour boiling water over the leaves. Let brew for 7 to 10 minutes. I let tea brew for 9 minutes for a stronger flavor. Warning...the leaves in this tea are very small!